(Bloomberg) -- The Federal Reserve may not see much inflation, but the stock market sure can, and its whereabouts helps explain why enthusiasm for equities continues to build. To find it you must drill into the earnings statements of American companies -- beyond sales and earnings and down to the lines that track profitability and pricing power. It’s in the row labeled gross margin, which the terminal defines as the percentage of revenue a company keeps after the costs of producing the goods and services they sell. Long story short, for the majority of S&P 500 constituents, it’s going up, evidence most companies still are managing to raise prices faster than wages and raw material costs eat into sales. To some it’s an incipient inflation harbinger, though one that along with rising sales helps explain why analysts see another year of earnings growth in the benchmark index. Combine it with a Fed that is all but committed to holding rates steady for the rest of 2019, and it becomes a recipe for rational exuberance among risk-loving investors. That’s the rub, that what’s good for earnings and great for investors might contain the seeds of doom for the Fed’s suddenly stimulative stance somewhere down the line. 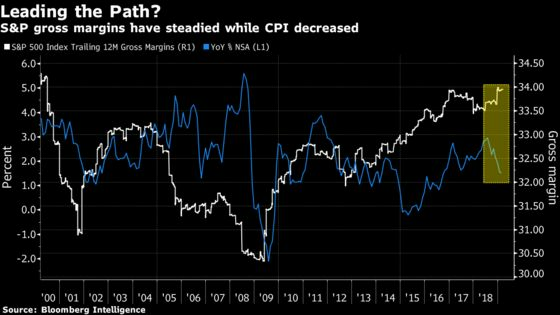 “S&P 500 gross margins don’t correlate perfectly with economic measures of inflation, but peaks have historically led peaks in U.S. consumer price inflation by 6-12 months,” Adams’s team wrote. That aside, the trend in gross margin is one of the few bull cases left on corporate profits, on the eve of a first-quarter earnings season that may show the biggest drop for S&P 500 profits in three years. More than 200 companies in the index are expected to say they earned less than a year ago when they disclose results, starting with banks about three weeks from today. This follows a rally that started on Christmas Eve that has added about $4 trillion to the benchmark’s market value. 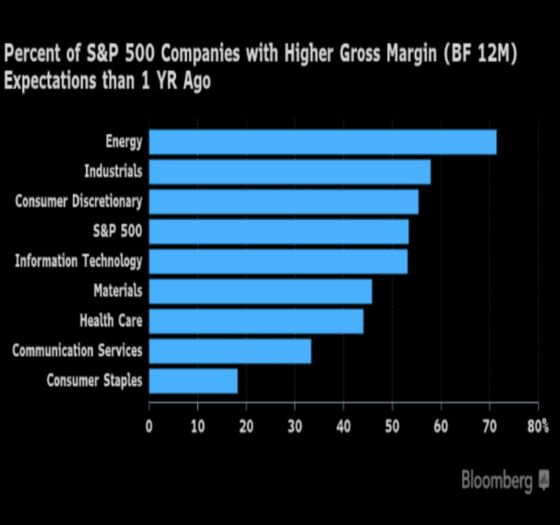 Analysts estimate the profitability measure should rise for 53 percent of S&P 500 companies over the next 12 months, Bloomberg Intelligence data show, with energy, technology, and consumer discretionary stocks seeing the strongest ability to raise prices. To be sure, the pricing-power bounty is not ubiquitous, with just over half of S&P 500 constituents succeeding in passing costs along. For Goldman Sachs, that makes now a time for investors to exercise discretion. A basket of companies with the best record of raising prices has beaten its counterpart by more than 15 percent since last May, Goldman Sachs data show. The outperformance has accelerated this year as the Fed signaled it’s willing to tolerate higher inflation. At Ameriprise Financial, there’s a similar focus.